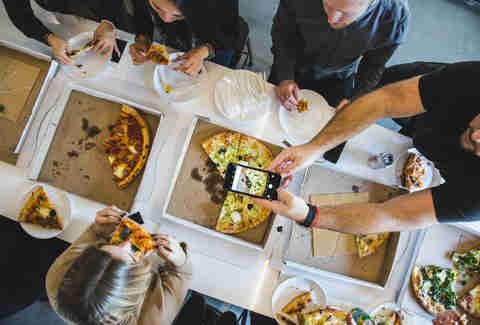 New York, Chicago, and Detroit are all one with the Pizza Gods, but when it comes to a community’s love for cheese, bread, and sauce, maybe Toronto deserves that fourth spot (sorry, St. Louis, that "cheese" you call Provel is gross). 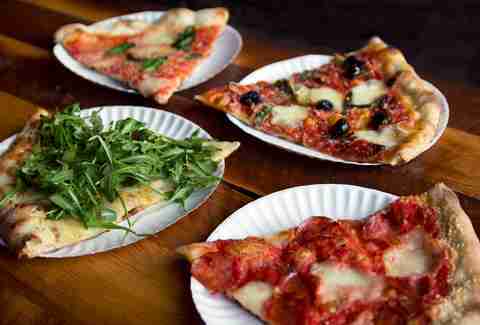 We're smitten with tomato pies and have been since the golden days of Frank Vetere’s Pizzeria and Mother’s Pizza. To illustrate our love, we've crafted a definitive list of the GTA’s top parlors that will fill you up with a neighborly dose of red sauce and mozzarella. The folks behind Hub Coffee House have transformed the old Churrasqueira Nova Lisboa space (RIP) into a full-fledged pizza joint that bakes nonna-approved thin-crust varieties. Specialities include the classic pepperoni and mushroom trio (porcini, shimeji, and button); on the weekends, it’s the perfect spot to grab a slice and a shot of Wild Turkey. 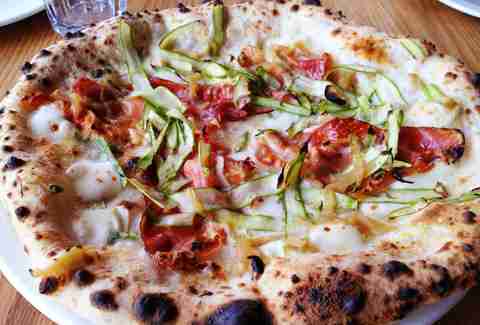 Located in the heart of Leslieville, Descendant caters to a specific kind of pizza enthusiast. In this case, it's those that live for a little Detroit-style lovin'. 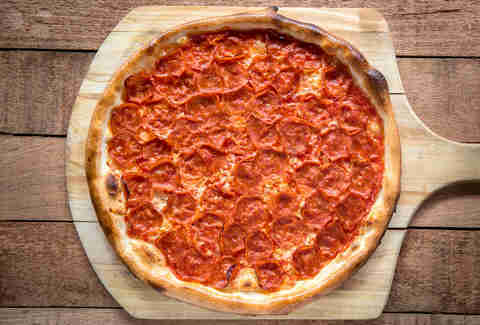 Christopher Getchell's pies are thick and doughy, but his cheese-to-red-sauce ratio is a divine example of mathematics that makes sharing a Double Pep fairly easy. If you're looking for something new, try the Soppressata Marmalade laced with salami, Calabrian chiles, and smoked caciocavallo cheese. If you’re looking for a classic, absolutely no-frills slice of pizza, it’s hard to top Bitondo’s. The Little Italy spot is still tucked away on Clinton St next to San Francesco Foods and has been serving up double-wide, greasy, thin-crust slices for more than 50 years. The sauce is a little on the sweet side, but it’s still a delicious, filling slice. Danforth Pizza is another old-school joint that's been serving up pies for more than 50 years. While it has catered to an infinite amount of orders, Elizabeth Manikas and her sons still value tradition. 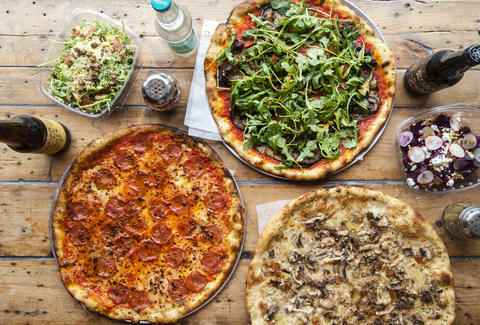 The whole pizzas are puffier than they are crispy, and the cheeses are an in-house secret blend covering all the other toppings you order on your pie. Tip: order a 14in and top it with hot soppressata and pineapple. Jennifer Bundock’s vegan bakery has become a retreat for Nanaimo brownies ($4.85) and pink Simpson’s Donuts ($2.85), but Apiecalypse Now! 's (yes, vegan) pizzas are still the showstopper. Using organic ingredients, fresh dough, and sauce that’s made from scratch daily, the store's offerings include creations such as the Mac & Charlie, made with mac & cheese, buffalo not-chicken, and jalapeño and mozzerella "cheeses," and The Pig Destroyer Destroyer, with a whopping two types of cheese, garlic sauce, hot sauce, hickory BBQ soy curls, Seitanrizo crumbles, not-chicken, bacon bits, pepperoni slices, and garlic artichokes (phew). If you prefer to keep it simple, opt for the margherita-styled SLAYER!!!11!!11!1! !1, which is appropriately branded with a hot sauce pentagram. Matty Matheson and company’s Chinatown shop is already making its mark on Toronto’s pizza scene. Maker’s menu is stocked with wings, beet salads, and $10 bodega sandwiches, but how can you ignore the 13 signature red & white pies? Sasquash rolls with roasted squash, blue cheese, pumpkin seeds, and lemon chili-dressed radicchio, while Apocalypse Cow (sorry pun haters, #dealwithit) tosses together mini meatballs, pepperoncini, and Parmesan. Josh Spatz, Alex Potter, and Frank Pinello have made Queen West Neapolitan-style pizza a thing, and have done so by slinging pared-down yet sophisticated creations, like a white pizza with garlic ricotta, mozzarella, and arugula, or Killer Bee, drizzled in honey and sprinkled with mozzarella, Calabrese sausage, serrano peppers, and pickled red onions on top of red sauce, by the slice. Can’t do delivery? Grab a bite at one of the counters at Get Well on Dundas or at Greater Good Bar at 229 Geary Ave. It's true: Amylee Silva and Michael Kolkas' redesigned pizza parlour lays it on thick. The Queen East spot has always been a landmark for classic ice cream cones, but the duo have introduced Leslieville (and now Queen West) to Regina-style pies which are a dense, toppings-heavy hybrid of Chicago deep dish. If you don't believe us, then try diving into a 15in double pepperoni & mushroom layered with more than 60 (!) slices of pepperoni, because there's no such thing as too much pep. The Neapolitan pizzeria now has four outposts in Toronto (Ossington, Danforth, University, and King West), and each specializes in wood-oven pies that emphasize flavor. The menu is chock-full of classic Neapolitan staples such as the Libretto Margherita (upgraded with buffalo mozz and Grana Padano) and Napoletana. Then there are the envelope pushers: duck confit with bosc pear and mozzarella, cacciatore salami, cremini mushroom, and the Ontario prosciutto and arugula pizzas. Terroni’s Italian bakery is a hidden gem that specializes in fresh bread, prosciutto sandwiches, and afternoon delights like bombolones, but the ultimate takeaway is its slices. 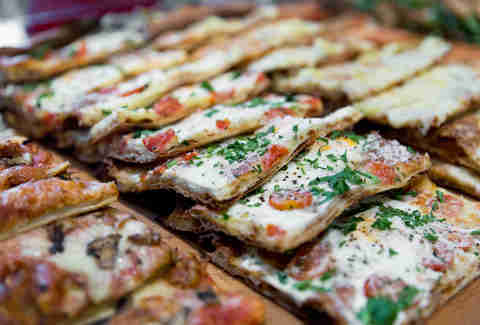 Sud Forno’s pizza al taglio are cut into Roman-style pieces that come in red or white, and are typically adorned with fresh mozzarella, sausage, squash, artichokes, and/or cherry tomatoes. 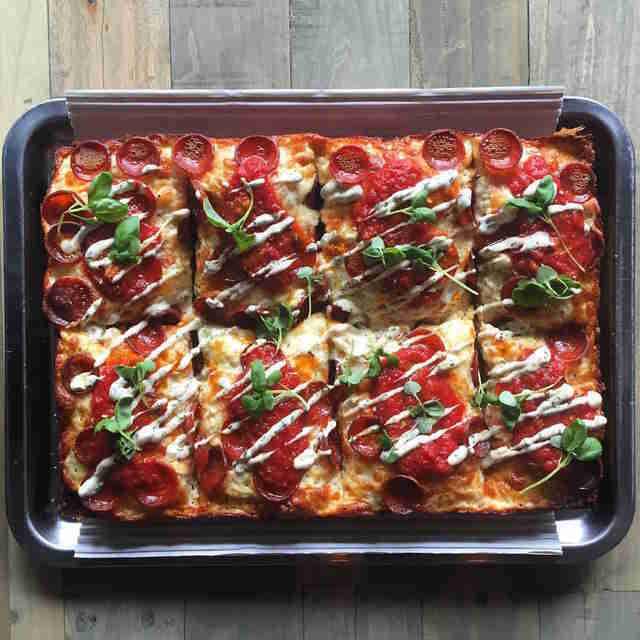 As a new(ish) addition to Corktown, TrueTrue absolutely nails its take on DIY artisanal pizza. The pies are a personal-sized, thin-crust variation of pissaladière, and the customization is on a different tier -- there's a total of 27 protein and vegetable toppings to be had, including fennel sausage, Napoli salami, falafel, kale, rapini, and pineapple salsa. That being said, its salad game is on-point, each packed with tons of fruits, veggies, legumes, and nuts, and with wine and craft beer on tap, it's bound to become a health-smart favorite. Keeping up with The Annex’s traditions, ZA Pizzeria eats, sleeps, and lives by a whole new type of pie: BBQ pizza. 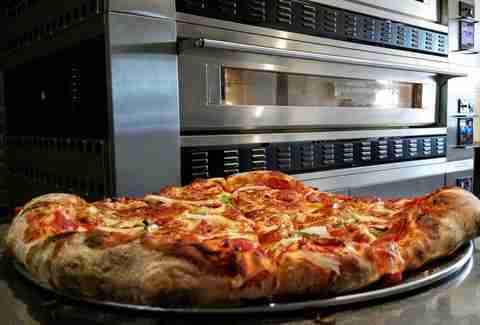 But this isn't the only pizza Jason and Lisa Costantini are cooking up -- their shop uses a traditional gas grill/oven contraption that adds a distinct smokiness to the everyday selects, such as the margherita, eggplant Parmesan, and sausage & peppers. The best part is the dips cost only $1 (go for the smoked tomato aioli), and delivery runs until 12am on Fridays. Joshua Khan is a Toronto-based writer whose go-to pizza topping combination is pepperoni, grilled chicken, and pineapple. Follow him and his endeavors over at: @blaremag.